It is April in Manhattan and the destinies of four very different men are about to collide. Nineteen-year-old Finn has just arrived in the city with his irrepressible and volatile girlfriend, Dilly, determined to even the score with his older brother Jack for abandoning him in the UK in the aftermath of their parents&#x2019; deaths. Across town, successful gallery owner Leo Emerson is haunted by loneliness, unsettled by the contrast between his life and that of his brother-in-law and oldest friend William, who is enviably contented in his faith and his marriage.<br />When Finn wanders into Leo&#x2019;s gallery, a series of unexpected and interconnected events unfold, changing the lives of all four men, for better or worse. Leo and William&#x2019;s settled existences are overturned by events outside of their control, while Jack and Finn&#x2019;s complex relationship reaches its long overdue showdown.<br />Beautifully orchestrated and richly comic, Men Like Air explores the romance and solitude of cosmopolitan life, the transformative power of art, and the impact we have on one another&#x2019;s lives &#x2013; and what happens when the ties that bind us are tested or broken. It is an intense and uplifting story of growth and renewal, mapping the complex workings of the human heart across the streets of New York City.<br />Tom Connolly is also the author of The Spider Truces.<br /><br />It is April in Manhattan and the destinies of four very different men are about to collide. Nineteen-year-old Finn has just arrived in the city with his irrepressible and volatile girlfriend, Dilly, determined to even the score with his older brother Jack for abandoning him in the UK in the aftermath of their parents&#x2019; deaths. Across town, successful gallery owner Leo Emerson is haunted by loneliness, unsettled by the contrast between his life and that of his brother-in-law and oldest friend William, who is enviably contented in his faith and his marriage. When Finn wanders into Leo&#x2019;s gallery, a series of unexpected and interconnected events unfold, changing the lives of all four men, for better or worse. Leo and William&#x2019;s settled existences are overturned by events outside of their control, while Jack and Finn&#x2019;s complex relationship reaches its long overdue showdown. 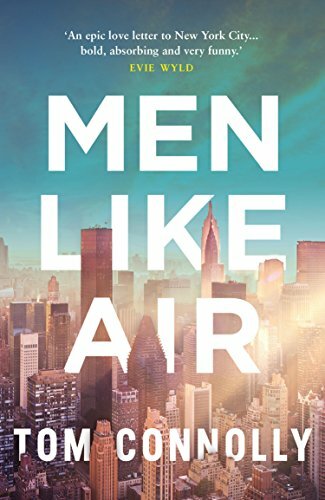 Beautifully orchestrated and richly comic, Men Like Air explores the romance and solitude of cosmopolitan life, the transformative power of art, and the impact we have on one another&#x2019;s lives &#x2013; and what happens when the ties that bind us are tested or broken. It is an intense and uplifting story of growth and renewal, mapping the complex workings of the human heart across the streets of New York City. Tom Connolly is also the author of The Spider Truces.